Home→News→Lake Sturgeon tagging nearly complete… Let the Stocking Begin !!! Lake Sturgeon tagging nearly complete… Let the Stocking Begin !!! 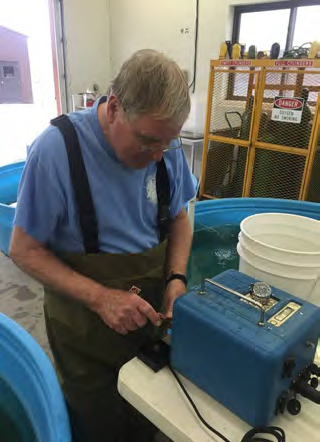 Volunteer Don Schroeder tagging lake sturgeon at the Genoa National Fish Hatchery. Partners working together to place passive integrated transponder tags into lake sturgeon headed for stocking to the Saginaw and Maumee River. This year Genoa National Fish Hatchery staff collected eggs from the Wolf, Wisconsin, Rainy, St. Clair and St. Lawrence Rivers. 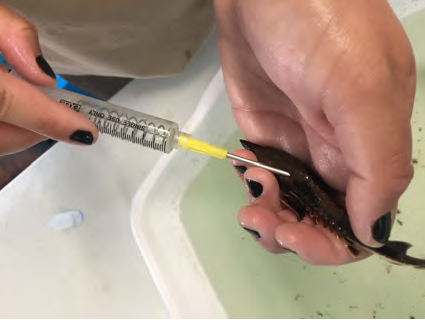 Throughout the summer hatchery biologists, pathways students and Youth Conservation Corp. enrollees have their hands full feeding and caring for lake sturgeon. During the summer months of intensive culture, sturgeon are fed a diet of brine shrimp, bloodworms and krill at least three times daily. Near the end of the summer with ideal water temperatures lake sturgeon average 6-8 inches in length. Once reaching this length all sturgeon are coded wire tagged, which gives them a batch identification number and allows resource managers to assess future population growth and survival. Hatchery staff rely heavily on partnerships between Friends Groups, school groups and other volunteers to assist with tagging the many strains of sturgeon before they leave station. The mission of the Friends Groups coincides with the Fish and Wildlife Service mission of conserving and protecting America’s Fish and Wildlife resources and their habitat for the continuing benefit of people. This year the Friends of Pools 8 and 9, as well as many other volunteers assisted with tagging, sample counting and checking for tag retention. Once these fish are tagged they are ready for transport to many locations from Northern Minnesota to Southern Tennessee and west to South Dakota and east as far as New York in support of continued restoration efforts.